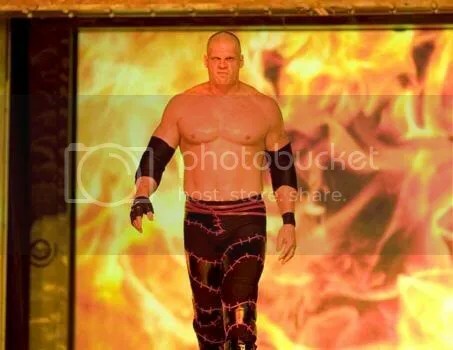 WWE Superstar, Kane, the big red machine has always been known to do controversial storylines that everyone hates. But yet, even if the storyline everyone hates picks up some controversy and picks up some major buzz in the wrestling community. First it was Kane’s encounter with baseball legend Pete Rose at most Wrestlemania’s. Next comes the Katie Vick necrophyliac storyline and his romance storyline with former WWE Diva, Lita. Kane’s most popular storyline was when he finally removed his mask. Here is a new one. At the end of last Monday’s RAW after Kane, lost the Fatal 4 Way match for the number one contender of the WWE Champion, Kane the big monster finally came back. Out of Kane’s mouth says, “Who is he? Is he dead or alive?” to announcers Michael Cole and Jerry Lawler. Who is Kane reffering to? It is obviously from Kane’s past. The most likely choices could be the Undertaker or Paul Bearer. Either that, or don’t be surprised that it could it be even Mr. McMahon as another one of McMahon’s tricks. I’m glad the WWE is finally putting Kane in a storyline. They just have him wrestle over the years, not perform in any angles. Kane’s a good performer and a good mic worker. I’m glad he’s back on RAW. Previous PostReport: The Who honored at “Vh1’s Rock Honors”…Next PostBREAKING NEWS: School of Rock sequel is greenlighted! Richard Linklater is set to direct and Jack Black will play Dewey Finn again!!!!!!! Some people said they were not fought really. I really want to know is this match are really fighting matches.